Installment #2 in this challenge comes a long time after the first. However this is the first one that is actually served at Oktoberfest, as only beers brewed within the Munich city borders can be served at the festival. 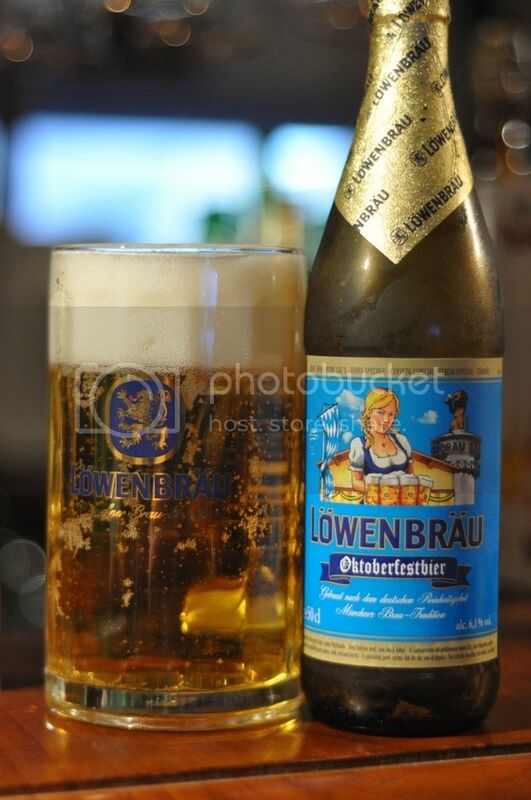 The Löwenbräu oktoberfest beer has been brewed to the same recipe since it's inception in 1810. The Löwenbräukeller is one of the most recogniseable brewery buildings in the world (see photo). When I last went to Munich I had the opportunity to visit this place and it is definitely not to be missed. Marzen beers are named after the old tradition of brewing beers in March to last the summer months when old lambic brewing proved difficult, although this does not happen any more with the appearance of modern brewing the name remains. The pour of this beer is very unusual for an Oktoberfest beer. The beer appears much lighter than most I've seen although funnily enough not lighter than the Weihenstephaner one from earlier in this challenge. The colour is a light golden hue with lots of bubbles rising to a thick white head. The head has a very thick density and looks fantastic. I would happily drink a lager that looks like this, so this will hopefully be good. Like it's regular beer, Löwenbräu Oktoberfest has lots of sweet smelling bready malts. The most startling part of the aroma however was these huge peppery hops. The flavours are very strong and very clean with a happy hint of alcohol, not enough to disturb the aroma though. I also get some citrus hints on the end of the nose which makes the beer seem accessible and refreshing. First off the bat, this beer taste almost keg fresh it's that smooth! Lots of carbonation and a good medium body make for a lovely mouthfeel. The malts taste not quite bready but more like dough or crackers, but they form a good bedding for the spicy peppery hops to come in and make a real impact. Following this up with refreshing grassy hops make this a really good thirst quenching beer. There is also a hint of alcohol, just to remind you it packs a punch despite it drinkability! This is just how you would like an Oktoberfest beer to be, very tasty and incredibly drinkable. This one is also available in Mini-keg form sporadically and apparently is even better in that. For those who haven't had an Oktoberfest beer this would be a good one to start with, and for veterans get on this because it's a great beer. A good beer to splash out on for a hot summers day.